I would love to be able to include photographs of some of the most distant known objects in the solar system in this calendar -- Pluto, or Charon, or Eris, or Makemake or Sedna, for instance. But, with apologies to the planetary astronomers out there, I'm restricting this series to places we've actually visited, from which we've returned photos that provide some surface detail for geologists like myself to mull over. So you won't see any of those trans-Neptunian objects in the calendar. Triton will have to stand for them all. Here is a lovely mosaic produced by Ted Stryk from Voyager 2 images. Click to enlarge and you'll see why geologists described the surface of most of Triton as "cantaloupe terrain." Really, it looks so much like the melon that I wonder if Triton is orange inside. 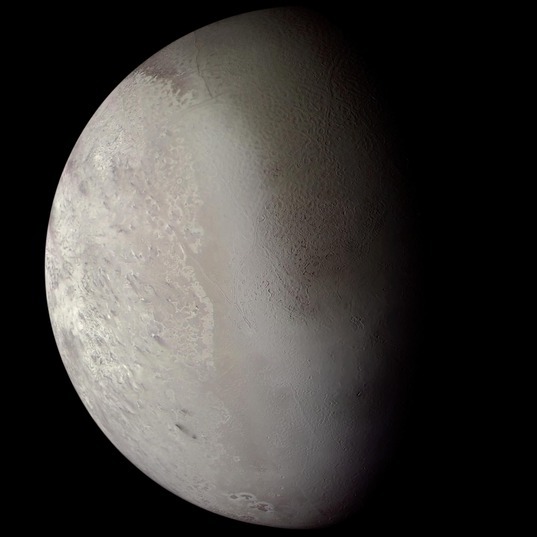 Triton is Neptune's largest moon; at a diameter of 2,700 kilometers it's smaller than Earth's moon, Saturn's Titan, or the Galilean satellites of Jupiter but much larger than the other icy moons of Saturn or Uranus. So you'd be excused if you thought it probably formed the same way that the rest of the classical icy moons of the outer solar system did, condensing from a nebula of gas and dust in orbit around the planet. But Triton probably didn't form that way; in fact it probably didn't form with Neptune at all. The biggest hint as to why is its orbit: it travels around Neptune in an inclined, retrograde orbit -- that is to say, it travels around Neptune in a direction opposite to the way Neptune rotates. Triton is more likely a captured body that formed elsewhere in the solar system, most likely an object out of the Kuiper belt, perturbed from its original orbit and gravitationally captured into Neptune orbit. Triton is so big that this capture process would have played havoc with any other smaller icy moons that Neptune may once have had, which would explain why Neptune has no other big moons. The next biggest one is Proteus, which is even smaller than Mimas. So if we could return to the Neptune system with a spacecraft, we wouldn't only be studying one of the solar system's two ice giants, but we'd get, as a bonus, a close investigation of a large body from the Kuiper belt. In fact, if Triton really came from the Kuiper belt, it'd be the largest such object known; Eris and Pluto are both smaller.